Does Your Dark Circle Spoil Your Look? 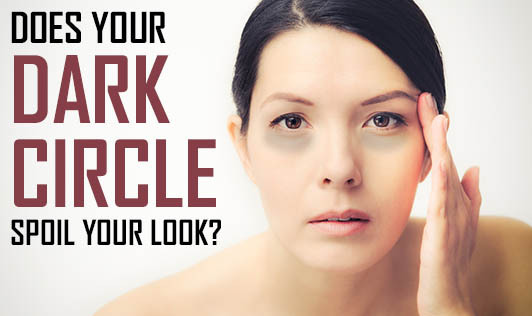 Dark circles are dark blemishes around the eyes. There are many causes for this, of which heredity stands first. ?The dark circles under the eyes are blood vessels that can be seen through the skin. The skin around the eyelids (peri-orbital skin) is the thinnest skin in the body and it is around 0.5 mm thick compared to 2 mm in other areas. Heredity: When blood passes through the large veins close to the surface of the skin, it can produce a bluish tint. The more transparent the skin is (also an inherited trait), the darker the circles appear. In people with a deep-set bone structure, shadowing can also contribute to the dark color under the eyes. Medications: Any medications that cause blood vessels to dilate can cause circles under the eyes to darken. Because the skin under the eyes is very delicate, any increased blood flow shows through the skin. Anemia: Lack of a balanced diet can contribute to the discoloration of the area under the eyes. It is believed that a lack of iron in the blood can cause dark circles as well. Iron deficiency is the most common type of anemia and this condition is a sign that the body tissues are receiving insufficient amount of oxygen. ?The skin can also become paler during pregnancy and menstruation (due to lack of iron), allowing the underlying veins under the eyes to become more visible. Insomnia: Lack of sleep or excessive tiredness can cause paleness of the skin, allowing the blood underneath the skin to become more visible and appear bluer or darker. Age: Dark circles are likely to become more noticeable and permanent with age. This is because as people get older, their skin loses collagen, becoming thinner and more translucent. ?Circles may also gradually begin to appear darker in one eye than the other as a result of some habitual facial expressions, such as an uneven smile. How can you cure Dark Circles? ?There has been no “end-all” to curing or reducing dark circles. There are many home-made ingredients that can help make the dark circles less visible. Some of them place teabags under the eyes, apply a slice of raw or cold cucumber under the eyes and drink plenty of water to help reduce the darkness of these circles. Recent research has shown that applying an eye cream that contains vitamin K may also be helpful. Long-term daily use seems to have a good effect.? ?Please consult with a dermatologist for a better solution.